Wu Chen-yao (吳禎耀) can still recall his teenage days when he played in Lyu-Chuan (綠川), a 6.1-kilometer canal that runs through the Central District of Taichung. "There were all kinds of fish: tilapia, eel,... and we would go into the water to catch them while our mothers washed clothes there," said Wu, 67, head of Chikuang Ward in the district, as he remembered how the waterway has shaped the city. Many people in the neighborhood share similar nostalgia with Wu, as the canal once created leisure and prosperity for downtown Taichung but gradually lost its glory due to water pollution and westward urban development. The Central District is the birthplace of Taichung's cultural and economic activities, which is crossed by two major canals of the city -- Lyu-Chuan and Liu-Chuan (柳川). But local people nowadays usually just call them "ditches" due to heavy pollution caused by household and industrial wastewater since the central Taiwan city's industrialization in the 1980s. With more residents moving out from the district in the 1990s, when urban development sprawled westward, the canals received even less attention, apart from complaints about their bad smell. But things seem to be changing under a government-led project since 2014 to revitalize the district. A 17-month Lyu-Chuan renewal plan has been recently completed and was open to the public Feb. 10, following a similar project with Liu-Chuan between 2014 and 2016. 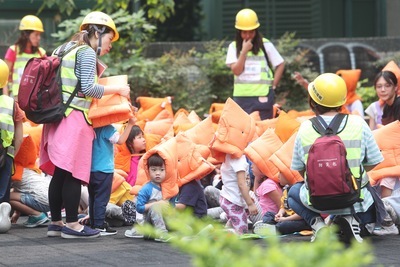 The initiatives are aimed at improving the canals' water quality and flood prevention capabilities, as well as creating a water-friendly environment to make the old district more attractive, said Chou Ting-chang (周廷彰), head of the city's Water Resources Bureau. "The management of the waterways determines a city's destiny," Chou told CNA. "We want to restore the reputation of 'Little Kyoto' for the old downtown." Urban development in Taichung, which started in 1900 during the Japanese colonial period, was modeled after the ancient Japanese city of Kyoto, known for its beautiful rivers and checkerboard-style streets. Renovation work started with Liu-Chuan, as it is located in a more spacious environment with less traffic, Chou said, adding that the pilot project was then used to solicit public feedback and adjust further work on Lyu-Chuan. Facilities were established in both canals, which divert polluted water to nearby sewage treatment plants before being released back into the waterways, he said. With Lyu-Chuan, the bureau even introduced fresh water from Hansi River in its upstream reaches, said Chou. These methods have led to significant improvement in the canals' water quality, the bureau said, citing the River Pollution Index -- Liu-Chuan from 9 to 2.75 and Lyu-Chuan from 8.25 to 2.75 -- meaning that their pollution status has been downgraded from severely polluted to lightly polluted. To create a water-friendly environment for both citizens and tourists, the bureau has designated a 300-meter and 610-meter stretch along Liu-Chuan and Lyu-Chuan, respectively, where people can walk. The government even went a step further with the just-completed Lyu-Chuan project by applying a trademark for the canal, the first of its kind in Taiwan, as well as holding an exhibition to promote the waterway and the Central District. The idea of trademark is a result of brainstorm among local residents, Chou said, explaining that the "Lyu-Chuan Canal Vision Empowerment Program" has involved nearly 800 people during the construction period to discuss how they would like to position and manage the canal. Iehihuku, a 90-year-old bakery in Taichung, has launched Lyu-Chuan-themed pastry, while commemorative "Lyu-Chuan beers" and "Lyu-Chuan red envelopes" are on the market as well. Artists are also invited for a Feb. 3-March 11 exhibition, which asks them to use the five senses to describe what they feel about the river. Hsieh Hung-kuo (謝弘國), who leads a six-person team called "Taiwan River Writing Ink," is one of the participating artists. Hsieh said he is interpreting the river through "touch," and to do that, he collected mud from the riverbed and used professional sterilization and grinding methods to turn it into ink. "What struck me is that the mud from Lyu-Chuan is really green," according to Hsieh, who has collected and compared mud from 13 rivers across Taiwan. A New Taipei resident who went to school in Taichung, Hsieh said the renovation project provides a wonderful opportunity for people to get closer to Lyu-Chuan, which used to be capped in some parts to prevent bad smell but now has had the seals removed. "It's nice that they removed the ceiling so that the canal could meet the sunshine again," said the 25-year-old. "The project connects citizens with the waterway, a bond that will lead to more opportunities for better change." While the canal renovation projects have won recognition from the public, locals said there are still issues to be addressed. "Yes, the water is a bit cleaner and the environment is better," said Wu, the ward head. "But I am not sure how long Lyu-Chuan and its trademark will interest people so they will keep coming back for tourism or shopping." Grace Lin (林秀娟), who has had a close observation of how both canals have transformed over the years, pointed out that, with Liu-Chuan, there is simply not enough water-friendly space, diverse facilities, and integration of nearby tourism resources. There are other complaints, including that the water is not clean enough, and that the budget -- NT$370 million (US$12.6 million) for Liu-Chuan and NT$850 million for Lyu-Chuan -- is too expensive. In response, Chou said that there will be continuous construction of water-friendly spots along both canals, which will feature their nearby communities. For example, there will be a wooden bridge with abundant reading space on Lyu-Chuan near a neighborhood known for an independent bookstore, he said. A bike trail is also being considered near the National Chung Hsing University, which is downstream from Liu-Chuan, according to Chou. Taichung will continue to expand hydraulic improvements across the city, and has already got part of an NT$18 billion budget approved under the central government's forward-looking infrastructure project, he said. Huang Ching-sheng (黃慶聲), a teacher of cultural and historic studies in several community colleges in Taichung, voiced his vision for the canals. "A water-friendly space must integrate the elements of culture, safety and environment -- which will allow people to realize that they actually thrive with water," he said, stressing that public efforts are needed to create and maintain such a vibe. "The facelift project should especially appeal to the older generation," Wu said. "After all, it's always nice to walk and look around the cleaner canal to get a taste of the good old days."